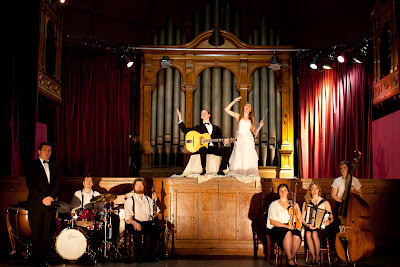 From 16th April to 11th May, Little Bulb Theatre (in collaboration with Battersea Arts Centre, where the performances will take place) are putting on their version of the Orpheus story which casts guitarist Django Reinhardt as the lead character - (we fact-checked, and had that confirmed). 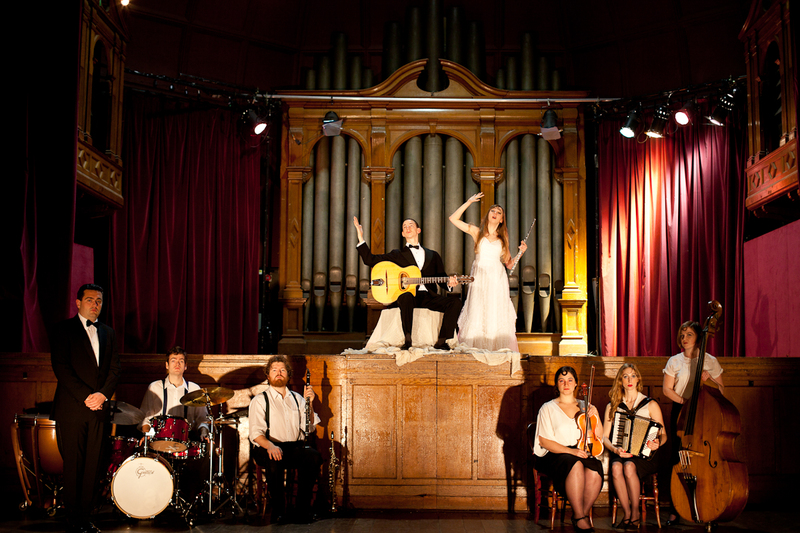 The group are unusual for their fusing of music and theatre and this production is underscored by live Hot Club jazz , musical interludes and late night dancing on Fridays and Saturdays. “When our director said he wanted to do a show using the music of Django Reinhardt I said, “you’re joking, we’ll never be good enough”. That was 2 years ago, since then a lot has changed. The eight actor/musicians in the company all had to learn to play jazz. Some were coming to the project with some experience, and some were starting from scratch on instruments they’d never played, with no knowledge of jazz theory. We started faithfully; transcribing solos and learning songs like Minor Swing note for note. Then we worked on our own versions and started studying improvisation. We frequented Le Quecumbar – the only dedicated venue promoting and supporting Gypsy Swing/Jazz and its performers. They have a jam night every Tuesday where fans of the music and virtuoso musicians gather to swing through Django’s back catalogue. On their recommendation we travelled to Samois-sur-Seine for the annual Django Festival where music is played in the campsites twenty-four hours a day. All the while we practiced avidly. We saw the show last Saturday night and are still under its spell. It was a delight in every way. Highly recommended!!! Agreed!! I've reviewed Orpheus for The Arts Desk and it should be published tomorrow Apr 23rd.